Global demand for cobalt, copper, nickel and manganese is booming as they are required in the production of electric batteries and clean energy technology and companies are now looking at the ocean as a possible source of these minerals. Gerald Barron, CEO of Deep Green, one of the companies involved in deep sea mining, said he believed getting battery metals from polymetallic nodules on the ocean floor was "the best shot we have to supply the transition away from fossil fuels in a way that does not make climate change worse." But Ann Dom, Deputy of Director of the Brussels-based charity Seas At Risk, said deep sea mining was unnecessary and the consequences for mankind and for the planet were incalculable. "Deep sea mining threatens an eco-system which is probably more diverse than the rainforests in some cases. Scientists have already issued several stark warnings that mining would lead to large scale irreversible biodiversity loss" Ms. Dom told Sputnik. She said there was evidence sponges and other life-forms deep in the ocean could one day contain a cure for cancer and Alzheimer's Disease. "Deep sea mining risks destroying a fragile environment that has a crucial life-sustaining role. All this to fuel a throw-away economy. If instead we learn to use metals much more efficiently, by redesigning, re-using and recycling products, it will not be necessary to open the deep sea for mining, " Ms. Dom told Sputnik. "Oxygen is also produced down there and deep sea mining is the beginning of an oxygen chain and to remove it you will not damage the ocean but life on the whole planet," Ms. Dom told Sputnik. Lockheed Martin, China's state-owned Minmetals and start-ups like Canada-based Deep Green are exploring ways of extracting polymetallic nodules — which contain one or more of the minerals — from the seabed. Keppel, a Singapore-based offshore drilling conglomerate, and DEME, a Belgian firm which specialises in dredging, have also set up subsidiaries to explore the feasibility of deep sea mining. Researchers are discovering species in the deep sea faster than they can name them. And do whales ingest polymetallic nodules to regulate their buoyancy underwater? The Jamaica-based International Seabed Authority (ISA) has handed out 29 contracts allowing companies to explore the floor of the ocean in international waters. The Russian, French, German, Japanese and South Korean governments are among those who have taken out exploration contracts. 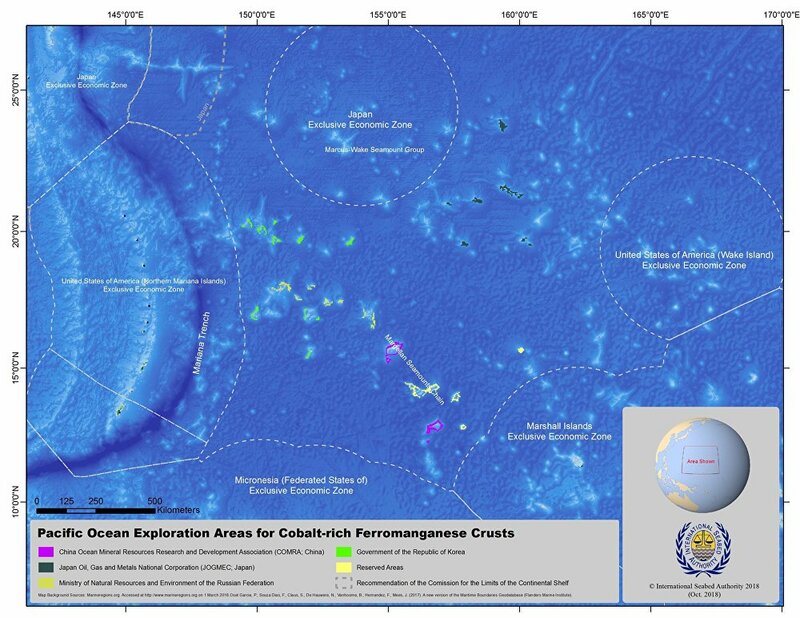 In territorial waters it is up to individual governments to determine whether to allow deep sea mining. Recently the government of Papua New Guinea has come under pressure to revoke a deep sea mining contract it handed to a Canadian firm, Nautilus Minerals, after local communities threatened legal action. Nautilus — which secured a $34 million credit facility in June — plans to extract gold and copper from the bed of the Bismarck Sea. The ISA is now drawing up rules on commercial deep sea mining but there is little doubt the ISA, which was set up in 1994 by the United Nations as part of the UN Convention on the Laws of the Sea, will give the green light to deep sea mining. The money from commercial deep sea mining contracts will be split between the 168 countries represented on the ISA. Ms. Dom said that under the convention the ISA had a dual role — to protect the deep sea, and to manage resources in a sustainable manner — but she said the ISA seems to be more intent on "promoting deep sea mining". She said ISA lacks environmental capacity and had transparency issues which could lead to weak environmental regulations. A source at the ISA told Sputnik they were hoping to draw up a commercial mining code in the "next couple of years". Seas At Risk joined more than 50 NGOs in writing to the ISA and calling for a moratorium on deep sea mining. Around 121.5 million tonnes of cobalt are estimated to be on the world's seafloor, compared with 25.5 million tonnes on land. The vast majority of the world's cobalt currently comes from the Democratic Republic of Congo — 66,000 million tonnes compared to 7,700 million tonnes from the next biggest producer, China — where child labour is often involved and the environmental damage is enormous. 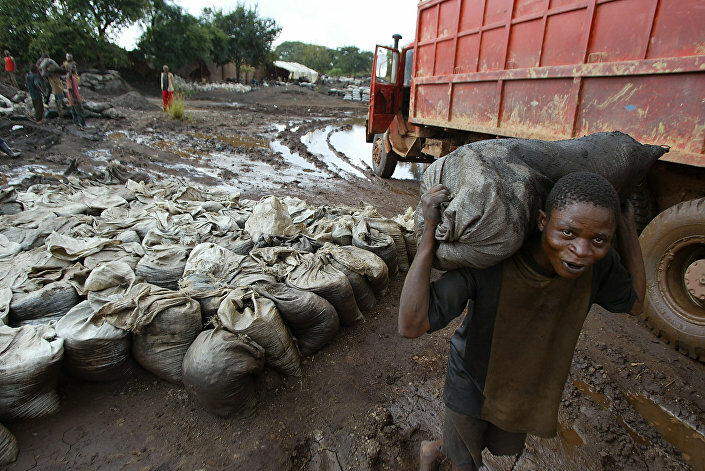 A young man carries wet cobalt on his back at the Shinkolobwe mine 35km from the town of Likasi, Democratic Republic of Congo, in this Saturday, April 10, 2004. But Ms. Dom says deep sea mining is not the answer. "I have not seen one study which says that if we go for deep sea mining that the mines in the Congo will close. You cannot solve one problem by creating another. We need to tackle the problems there before starting mining in the oceans or anywhere else," Ms. Dom told Sputnik. Deep Green, who are based in Vancouver, insist they will create minimal impact to the ocean. "Ocean health is at the core of our mission. We don't want to merely comply with the environmental standards, we aspire to leave the oceans better off as a result of our operations and we are heavily investing in that aspect of the business and have recently hired one of the world's leading oceanographers, Dr. Greg Stone, as our Chief Ocean Scientist to drive that ambition. It's also important to understand that we are operating in one of the largest deserts on the planet with a low biomass per square meter. We still have a lot of work to do to have a good picture of how biodiverse and unique the ocean floor environment in out exploration areas really is — and that work is part of our current focus," Deep Green CEO Gerald Barron told Sputnik. Krypton Ocean, a Ukrainian company which is based in the British Virgin Islands, says the prototypes it has designed — which can operate up to three miles down — cause minimal disruption to the ocean. "The seabed landscape remains untouched at the areas of contact between the ocean floor and a nodule-collecting tool of Krypton's deepsea mining vehicles. The recently tested design showed almost zero seabed ooze appearing in bunkers of the mining vehicles," said the company, in an article on Medium. But Ms. Dom said the reality was very different. "When it comes to the nodules they will have to be mined over a vast area so these enormous machines will be going like lawnmowers up and down the ocean floor and they will not be picking them up delicately. They will be trawling and picking up sediment and by doing so they will remove a layer of bacteria. Remove it and it will not return. The nodules themselves have biodiversity, like sponges, on them. And then there are the sediment plumes. Sometimes the sediment contains toxic elements and so you will have toxic plumes spreading over vast areas and falling on an extremely fragile environment," Ms. Dom told Sputnik. "Our position is one of sustainability and we see deep sea mining as a symptom of the wasteful society that we have, a throwaway economy where laptops are designed to break down after two years, and cannot be repaired because of the way they are made," Ms. Dom told Sputnik. She said the world needed to concentrate on moving away from over-consumption, and start focusing on sharing, reusing, repairing and recycling to conserve resources. "Let's compare two phenomena: the future of the global post-carbon economy backed by battery metals and the future of sponge living on nodules. Do both phenomena reflect the equal value for the humanity? The thing is that seabed mining is inevitable. It will start sooner or later with us or without us because the depletion of the onshore mineral deposits is not a myth. It is coming. The electric-driven economy won't do without seabed minerals," Krypton Ocean spokesman Konstantin Rovinskiy told Sputnik. "Any mining activity destroys natural biodiversity be it onshore or underwater. The task of seabed mining technology providers comes to minimising possible negative impact on marine biodiversity — minimising not eliminating. Krypton Ocean made all possible to transform the very process of seabed mining into something different from what we used to accepting as "mining". Our deepwater vehicles are equipped with unique mining tools that provide "harvesting" rather than mining. They can carefully pick up nodules from the ocean floor without touching anything else available there," Mr. Rovinskiy told Sputnik. He said the richest seabed mineral deposit — the Clarion Clipperton Zone (CCZ) in the Pacific — constitutes less than two percent of the total area of the ocean floor. "But the CCZ contains billions of tons of minerals sufficient for providing the whole of humanity with such battery metals as cobalt, nickel, and copper for hundreds of years while 98 percent of all sponges may live in the rest of the oceans for centuries," Mr. Rovinskiy told Sputnik. "A blanket moratorium on deep sea mining would be extremely unwise and detrimental to our ability to slow down climate change, and, as a consequence, to protect ocean health," Ms. Ilves from Deep Green told Sputnik. "To get off fossil fuels, we need to electrify over a billion vehicles and shift energy generation to renewables. This means we will need a billion electric vehicle batteries and a lot of energy storage capacity to be able to deal with the intermittency of renewable energy. The end-game here is to get to a closed loop where we keep recycling battery metals and making new batteries out of the metals we already have. But before we can get there, we need a massive new injection — millions of tonnes of nickel, cobalt, manganese and copper. Where are these metals going to come from? Cobalt and nickel are particularly troubling in this regard. Given where current projects and reserves are, the price tag for getting these metals will mean more child labour, more deforestation in tropical areas (our planet's lungs!) and more toxic tailings from processing — an unacceptable throwback in our quest to slow down climate change and ocean warming. Going to the ocean for these metals is a much better choice," Mr. Barron from Deep Green told Sputnik. Polymetallic nodules are just one of three types of minerals wanted by deep sea miners. The others are seafloor massive sulphides — chimneys rising from the ocean floor — and cobalt-rich crusts. The views and opinions expressed in this article are solely those of the speakers and do not necessarily reflect Sputnik's position.